This week has been quite a week... already. So, it really makes me happy to see in my planner (which is full of work-related scratch-outs, reschedulings, meetings, trainings, etc) that this Saturday has a neatly written "Melting Pot with friends" on it. Hallelujah. It really couldn't have come at a better time. I've been fortunate enough to meet some really great work colleagues, who have turned into some really great friends. So this weekend (for the second time), Randy and I are going out with our friends Marianne and her husband, Jorge. Last month, we all enjoyed some really great tapas at Cafe Madrid, which then led to listening to some tunes at a local bar afterwards. This month (ooo so excited), we're headed to my favorite restaurant... the Melting Pot. Delicious. Everything about it is awesome - drinks, cheese fondue, salad, the main course meats, & to-die-for chocolate fondue. And with great food will come good conversation... Marianne and I are both speech therapists, afterall. 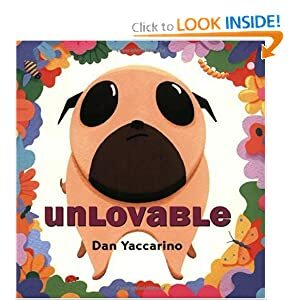 I'm also excited for this Saturday, because I bought Marianne's children (Jennasey & Mateo) my favorite children's book, Unlovable. Jennasey (an awesome 8-year old who is one of the few children who could convince me that having kids is a good thing...) came over one afternoon with Marianne, and we all made glass pendants. She fell in love with our pugs, so I thought it was fitting that I give her the book, which is all about a pug named Alfred. So cute. A good lesson. I know they'll love it. Three days of unexpected free time has allowed my creative juices to flow after a long hiatus. After two hours of mulling around at Hobby Lobby, I came away with some goodies. I made a little window box for our master bathroom window. I used turquoise, red, golden, and plum flowers to give some much needed color to our bland bathroom. 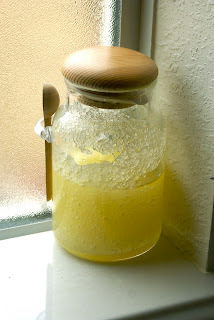 I've also had a renewed interest in homemade soaps/body products. So, I whipped up a body scrub infused with patchouli essential oil. It's also sitting on my bathroom window sill just ready for me to use with a calming bath. And, to round off the bath theme, I played around in the kitchen with some ingredients for soap. The pug soap was made with mashed banana for moisturizing dry skin. It actually doesn't smell too much like banana, which is good, since that scent isn't my favorite. This one is green tea soap infused with tea tree essential oil. Super fun. Can't wait to use them both.